Mosquitos can ruin the most beautiful of summer nights and outdoor spaces. When Bruce and I started entertaining on the deck last summer, I quickly realized we were going to be regularly presenting the mosquitos of the neighborhood with an all-you-can-eat buffet if I didn’t do something. 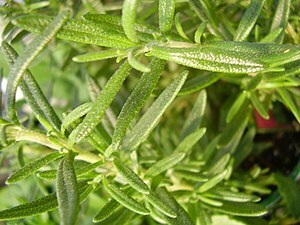 So, I put some research into what sorts of plants I could add to the garden that would help naturally deter mosquitos. What I found was an amazing boon as far as I was concerned! Many of the very same plants that help to repel mosquitos are also full-sun plants, which makes them really great additions for our roof-top deck garden that gets hit hard by the sun every day! Several of them are also draught-resistant plants – which means they can handle the heat and sun without requiring that I lug buckets of water outside every night (there is no hose available out there). So, without further adieu, here is a list of some plants to add to you garden to help keep mosquitos at bay this summer! 1. Catnip – also called Catmint, or Nepeta. 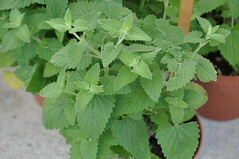 Catnip is the single most effective plant at deterring mosquitos. In studies, catnip was found to be 10 times more effective than DEET at keeping mosquitos away. Catnip is part of the mint family. Most mints have deeply fragrant leaves are distasteful to mosquitos, but very pleasant to humans! Catnip looks like a mint, but since you won’t be eating it, unlike the other herbs in your garden, you can allow it to flower in later summer, and it will have pretty delicate blue and white flowers for weeks. I appreciate how quickly this plant grows, the fact that it looks great in a container, is a great herb for so many cooking projects, and this evergreen perennial will come back year after year. Bonus – it is full-sun, and draught resistant. 3. 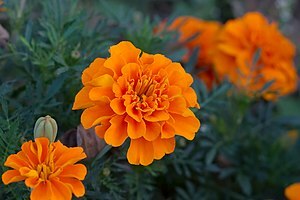 Marigolds – These perky flowers add color to a garden, but their real value lies in their scent – pungent oils keep mosquitos and other garden pests like aphids away. These flowers are not quite as hardy as the rest of the list. They faint in too hot weather, and need regular water. 4. Lavender – beautiful lavender is my idea of a perfect plant. It can grow huge, but smaller varietals grown nicely in containers. It is full sun, draught-resistant, repels mosquitos, and provides little purple blooms for weeks and weeks in the summer. 5. Beebalm – this more exotic cousin of the mint family produces big wild pink flowers that smell incredible in the summer. As you can guess from its name, it does attract bees, but it also repels mosquitos. it will also makes all your guests go “Wow! What is that?” In my experience. 6. 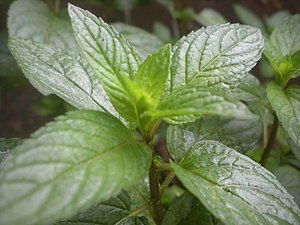 Mint – Peppermint is a hardy but fast growing plant. It will do well in a pot initially, but it will probably outgrow its container half way through the season. Instead of becoming rootbound, it will simply choke itself to death (which I discovered last year). Like some other herbs, you have to keep an eye on it and prevent it from flowering if you want it to stay sweet, for use in teas, drinks, and other recipes. 7. Lemongrass – this plant is rather famous for its mosquito-repelling properties. it can also be used in various asian dishes. You can also buy it at your local grocery store, or request ends from a local asian restaurant, and re-sprout them in water. Check it out on my Pinterest Page. That said, it is not particularly attractive. It sort of looks like crabgrass in the early stages, and then a huge grassy bush later on. 8. 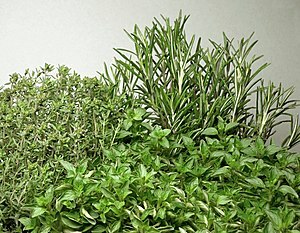 Herbs– most cooking herbs also have strong scents that are rumored to help repel mosquitos. Many herbs are also part of the mint family: peppermint, basil, rosemary, sage, marjoram, oregano, thyme, lavender, and salvia. I am not convinced any of them is quite as effective as some of the other plants in this list, but they can’t hurt to add to your garden. If nothing else, you will have more to cook with this summer! 9. Get a fan! One final really good way to ward off mosquitos is just to turn on a fan wherever you are sitting. Mosquitos are not very strong at flying, strangely enough. A small gust is enough to keep them at bay. Additionally, the fan will help to circulate the scents from your plants around where you are sitting – further dissuading the mosquitos. it will also help your guests stay comfortable on balmy nights. We bring a small oscillating fan from the house out onto the deck and turn it on while we are out there. Between it and the garden, we had a remarkably small incidence of bites last summer!